Increasingly organisations are realising the competitive advantage of having a highly engaged workforce, yet often struggle to create high levels of employee engagement. Research by Gallup in 2016 revealed that UK employees are less engaged now than they were 5 years ago despite increasing investment in this area. We simply see that this struggle is down to misunderstanding what employee engagement really is, meaning effort is put in the wrong places. Someone who is highly engaged will exercise discretionary effort to help their employer, offering more of their capability. The emotional connection is strong and so the employee wants to ‘go the extra mile’ for the employer… but in order to go the extra mile, we must equip employees to go the first mile in the first place. 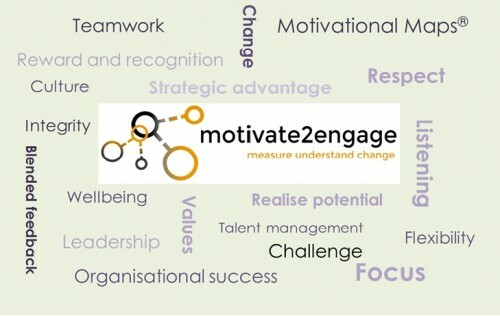 Working together with our co-consultant Emma Pitt, under our joint brand of motivate2engage we bring together the personal insight of motivational maps® with traditional employee engagement surveys to provide a much more rounded and thorough picture for employers to act on. We can also support change activity so you don’t just feel informed but can make necessary changes too.